I totally thought I was 20 something when I started this challenge. I mean, I was just celebrating my 21st Birth.. no nevermind. I'm 40 something. This week was an obvious reminder that I should scale back on physical labor or resign to hiring out. So what did I get done this week? Some floors. Ok, ok, you're disappointed!! I know, I am too. My big public project is now complete and I have caught up with my clients. So the next few weeks should prove fruitful. I taped until I couldn't tape anymore. The border and the interior border are now done...hmmmm, looking sparse in the center, but I will be adding some design in the center this week. I promise. I'm really digging the border around the room, highlighting the nook. I'm ready to play basketball, where's my hoop? 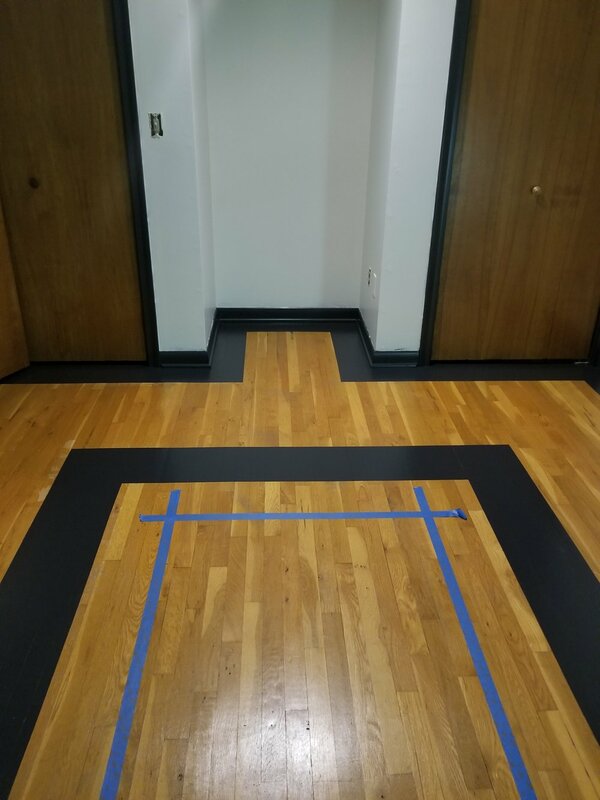 It makes some really beat floors look a little more put together! I'm thinking of putting the little day bed in the nook, it will fit nicely. Maybe build a small platform with bun feet and some decorative trim? The bookcases deserve this look, don't you agree? I also will be adding lighting, possibly painting the doors black and painting the low bookcases and interior of the big bookcases with the spectacular green color. I really can't wait..........to go to bed! Head over to the One Room Challenge page and cheer on the other participants!